We’ve all been there; attempting to guess how much a used device could be worth and hoping that it sells for a random price plucked from the air. Bidvoy, a Germany-based startup, is attempting to solve that problem by indexing completed eBay auctions and providing average price data as well as free trending information on the price over time. By analyzing all auctions on eBay, Bidvoy provides insights into price trends on the second-hand market that were previously unavailable. The service is extremely good at showing price changes over extended periods of time, with data going back well over the last six months. Bidvoy also offers a comparison to the current price of an equivalent new device on Amazon, as well as suggesting the best times to list your gadgets on an auction site for maximum profit. 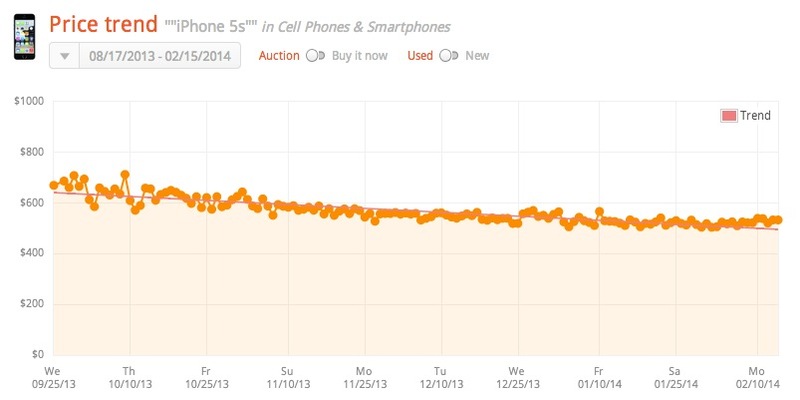 One of the most interesting searches we found was the price of the iPhone 5s, which has only lost around $50 of its value on the second-hand market in the last six months despite the release of the iPhone 5s and 5c in September. A search for the Nexus 5, shows that prices were initially high while stock was low but they steadily decreased over time as supply increased. Bidvoy also runs lists of the top devices, comparing them to each other on a leaderboard (the iPhone 4S is the most-sold phone on eBay according to the site). For those that are looking to sell (or buy) used electronics, Bidvoy can help squeeze every dollar out of the sale by giving insight like never before into other users’ success on eBay.